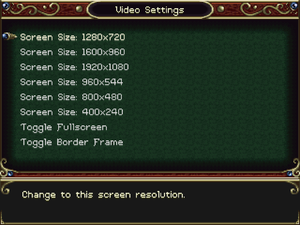 Although the game supports widescreen resolutions, the actual game screen runs at base resolution of 400x240 and is then upscaled to higher resolutions with pillarboxes. Toggled from the Options menu under Video Settings as Toggle Fullscreen. Fullscreen acts like borderless fullscreen windowed. Resolution upscales with Nearest neighbor scaling. Player and familiar control mappings are independent from each other. 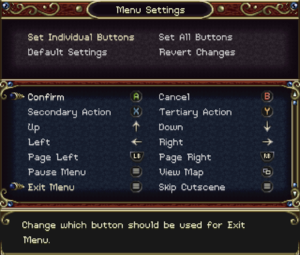 In-game prompts should be manually changed via Keyboard Preference setting from the Options menu to reflect on your input device. Controller and key remapping for gameplay. Controller and key remapping for menus. Mouse is not used at all. 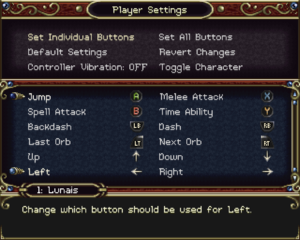 Button Style can be changed to your appropriate controller from the Options Menu. DirectInput controllers are also supported. Xbox 360, Xbox One, DualShock 4, and Nintendo Switch prompts are available. 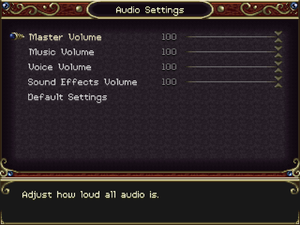 Master Volume, Background Music, Voice Overs, and Sound Effects. All dialogue is text-based outside of a few voices during gameplay. Combat chatter is not captioned. Player 1 must find their familiar first in order for Player 2 to control it. 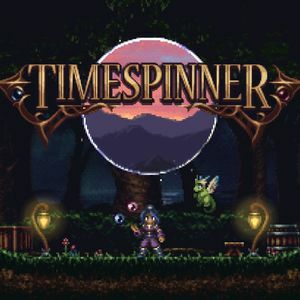 3.0 Mac OS and Linux versions only. This page was last edited on 28 March 2019, at 23:21.